I only came across the blog post 31 Days of Family History Fitness at the very end of January so I decided to do it in February instead. I’ll update you with my progress on a weekly basis. Day 25: Set up a research log to help you keep track of your research. You can find sample logs on our website. Be sure to include when and what you researched, plus what you found and where you found it. If you already have a research log, make sure it’s up to date and backed up. I’m really not sure about this one. I can understand the need for a research log when you are working on behalf of someone else, and to some extent that’s how the referenced sample log looks as well. So I don’t really know what to do here. I wouldn’t use the data in the log, so why keep it? Perhaps some of you that do keep research logs can tell me what the point of it is? Day 26: Find genealogy blogs or Facebook groups that cover your ancestry. In addition to having resources for various ethnic groups and research roadblocks, these groups will also allow you to collaborate with like-minded genealogists. Check out Family Tree Magazine’s list of blogs or the Geneabloggers’ Blog Roll. Back when I first started this blog, I took an online blogging course run by WordPress, and one piece of advice from that course was to find other blogs that interested you and follow them too. I found a number of the blogs I follow now back then, and have added to it gradually as I find others through various social media posts. I created a blog roll (which you can see on the right hand area of my blog if you are reading this post online) back then, but I haven’t updated it since. So, prompted by the task for today, I have updated my blog roll. Day 27: Review your privacy settings, and lock down your data as appropriate. Most online family trees will make any people who don’t have death dates private, but make sure that you know who can see what of your family’s information. Consider editing privacy settings to be more restrictive, using encryption to lock down your data, or changing your password to prevent hacking or unauthorized access to your account. My tree on ancestry is completely private, so for now I don’t have concerns. When I complete my work to the point where I choose to put it online, then I will have to ensure living people’s data is protected. Helpfully this comes built into TNG which is the model I intend to use to get it all on line. Day 28: Search the free Social Security Death Index on FamilySearch.org. Check for any 20th-century US relatives who lack death dates. There doesn’t seem to be an equivalent collection for the UK. I expect to find the death dates I need from the statutory records. Day 29: Pick a problem that you’re having in your research (tracing slave ancestors, finding ancestors before birth records began, etc.) and search the web or your local library for potential solutions. Resources like the FamilySearch Wiki or books or downloads from ShopFamilyTree.com may be able to help. My biggest problem at the moment is not having enough hours in the day to process all the data I already have. Once I get through all that then I will step back and look for incomplete people that I will then focus on. Day 30: Perform a quick Google search for the hometown of one of your ancestors. Learning about the places your ancestors lived (as well as how those communities have changed over time) can give you insight into your ancestors’ lives in ways other records can’t. Be sure to check out city directories and other place-specific resources to learn more. I know Unst fairly well, although, as I noted in the post about Old Maps, I am still discovering where some house names are on the maps. Going through the census page by page helps hugely with that because the houses are recorded by district and area, and in a fairly logical progression, i.e. if you come across an unknown house, it is likely somewhere close to the previous and next houses on the census. There are a number of areas that crop up again and again where Unst people moved to, such as Leith in Edinburgh, and Toxteth Park in Liverpool. Both are areas with docks which no doubt would be attractive to men who had grown up with fishing as a livelihood. These two areas are good candidates for me to dig into further. Day 31: Now that you’ve got your research in order, find some ways to share it! Look for project ideas on Pinterest, FamilyTreeMagazine.com and other websites to get started. I’ve enjoyed quite a few of these prompts that got me doing things that I knew I should be doing but wasn’t. While some aspects of my research was already in good shape, now other aspects are in better shape too. However, it is by no means finished, and so I’m not yet at a point where I’ll be putting it up online yet. That’s something I am looking forward to in the future though. I’ve written before about difficulties in reading the handwriting on old documents. I had another example again today when trying to read a street name. This was for someone who had moved from Unst, Shetland to South Shields, County Durham, so it was in an area I don’t know well. The street name looked like “Orange Street” but I could have also believed it to say “Osange Street” so, since I didn’t know the area, and one should get to know the area you are working in, I decided to look it up. Searching on Google Maps I could find no sign of either name. I recalled a previous time when I had been searching for a street and it turned out to no longer be there. So I thought it likely that the same had occurred with Orange Street. Normally I’m used to looking at old Scottish Maps, but now I needed the same facility for English Maps. I found such a facility at Old Maps.co.uk. In these old maps, I found that, sure enough, Orange Street and it’s neighbour Raglan Street that I had found by paging forward in the census both no longer existed. I found nearby streets Frederick Street, Green Street and Brunswick Street, all coming off Laygate to allow me to line up the old and new maps together to see where the old streets previously were. Area in South Shields where Orange Street used to be. .. the St Marks’s redevelopment scheme, at Laygate. On 3 July 1950 a notice had been placed in the South Shields Gazette giving notice, that the council of the Borough of South Shields … had made an order .. to compulsorily purchase the land and dwelling houses. Part one of the clearance area meant the demolition of Dixon Street, Raglan Street, Orange Street, Hardwick Street, Bedford Street – and part of Maxwell Street. There is a little stub of a road coming off what is now Bedford Avenue which appears to be the remnants of where Orange Street once was. If you look at in on Street View it’s a parking area leading to some garages. 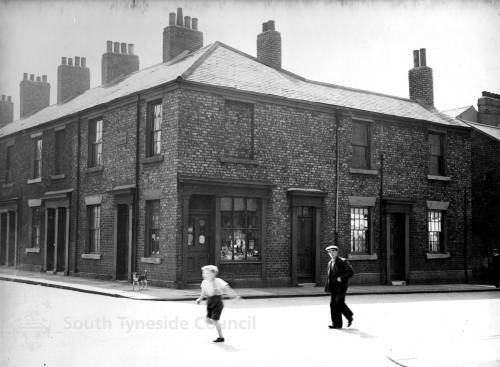 The Southtyneside images website has this photo of Orange Street (and the corner of Princes Street). When initially searching for Orange Street, I found various people asking for its location, so I will post links to this blog post as answers to their questions. I joined a local genealogy group, and today I gave a small presentation about James Moar, the man who turned to knitting when he do no other task to support himself. I’ve written about him in a number of blog posts before. I created the presentation from the material I had in the above blog posts, using some of the photographs as illustrations as I talked. I also used old maps to show where they lived, and showed the various census records and birth and death records that I had discovered when researching James’ life. I also talked about getting his Death record updated so that he was finally recorded correctly, which seemed to be met with great approval. I had one new piece of information in the presentation that is not in any of the previous blog posts. As you’ll know if you’ve read the others, James turned to knitting when he was invalided, and while he had a slow start, he did clearly get better. In the 1901 and 1911 census he is listed as a Shetland Lace Knitter, which shows a certain skill as that is a complex and delicate knitting style. 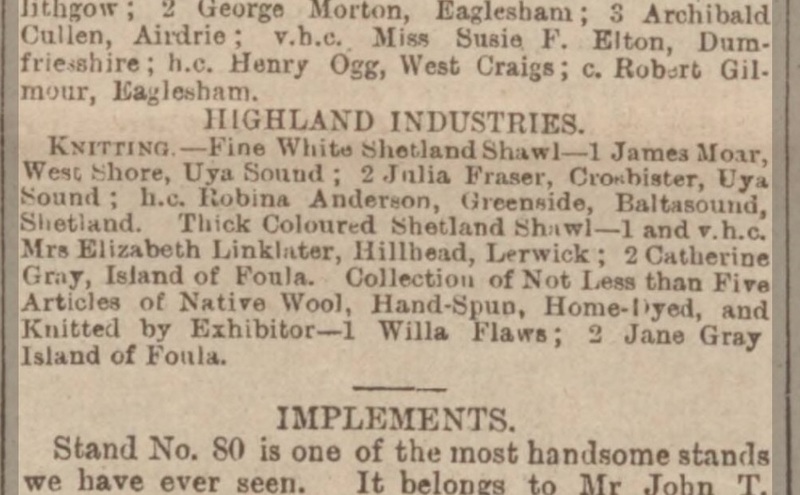 Well he, must have been quite good because he won first prize in the Aberdeen Highland show (held on Tuesday, July 24th 1894) for a Fine White Shetland Shawl, beating another lady from the same village, Uyeasound, into second place. I brought along my copy of the Unst Heritage Lace book for the group members to look at as well, since James is also mentioned in there. I think the presentation was well received, and I hope to maybe do another subject at a future meeting. 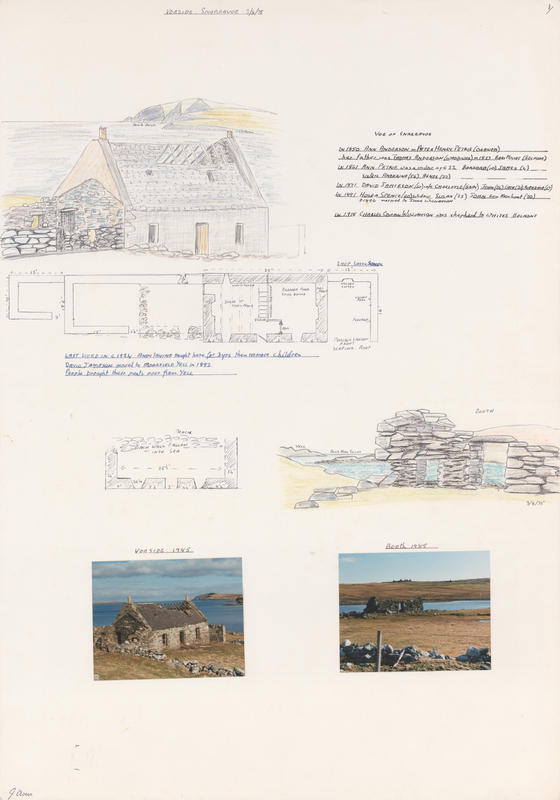 In the 1960s June Owers did a splendid job of identifying, drawing and listing inhabitants in some of the old empty croft houses in Unst or “vod” houses as they are called here. vod (adj) unoccupied, as a house. These are available to view at the Unst Heritage Centre. 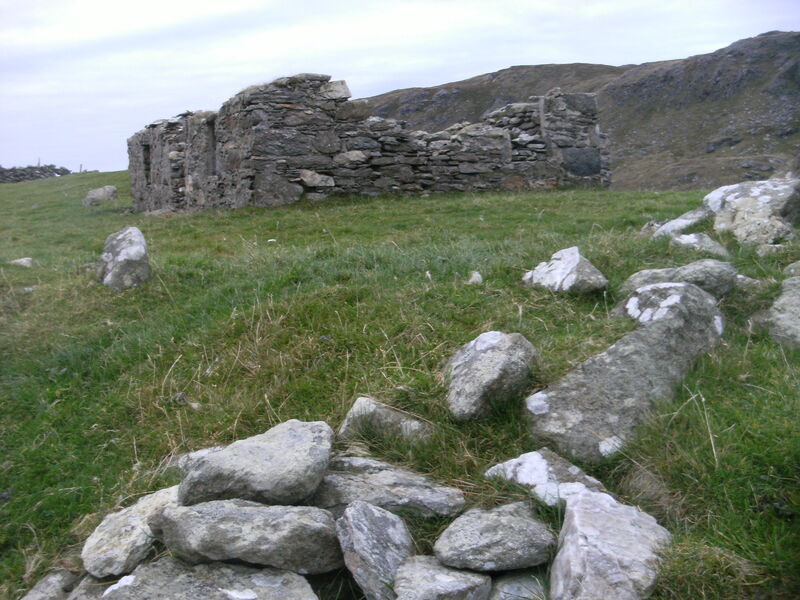 Those folk who come back to Unst to trace their family history find these invaluable. I have been thinking for a while now that we need to update this information by adding more houses to it. Even houses that are still lived in should be included with details of their history and the people who used to live in them in previous generations. Walking at the Westing recently, I looked at the old disused School and then at the two houses nearby, one apparently called Murrasko. I had found its name from this old map. Map of Westing showing Murrasko and the School. Click on the map to go to the zoom-able version on the NLS website. This view is spread across two maps, click on the LHS or RHS to go to the full view of the appropriate map. Later, putting it on a local social media group, various people came up with lots of information including names of folk who lived in the house. 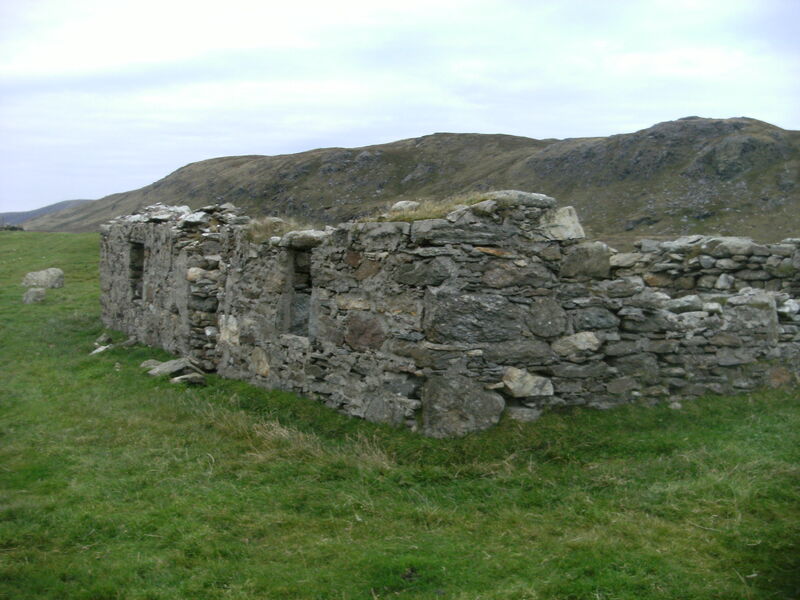 I decided that it would be good to ask people to help the Unst Heritage Centre to build on the existing material, including photos of houses and any information about who used to live there, and hopefully we can find out more, using family history resources, old maps etc. This is Springpark, the house I grew up in. So far I have found out that Charles Arthur, a retired school teacher who taught in Burrafirth School, lived there in 1891. Earlier there seems to be no reference to the house so I think it was built at that time or even perhaps built for Charles Arthur for his retirement. My Grandmother, Marjorie Gray, came to the house after her husband died, having previously lived in Hoyvilla, a tied house linked to his work. She lived in Springpark from the 1920s. My parents John and Mary Gray continued to live there. 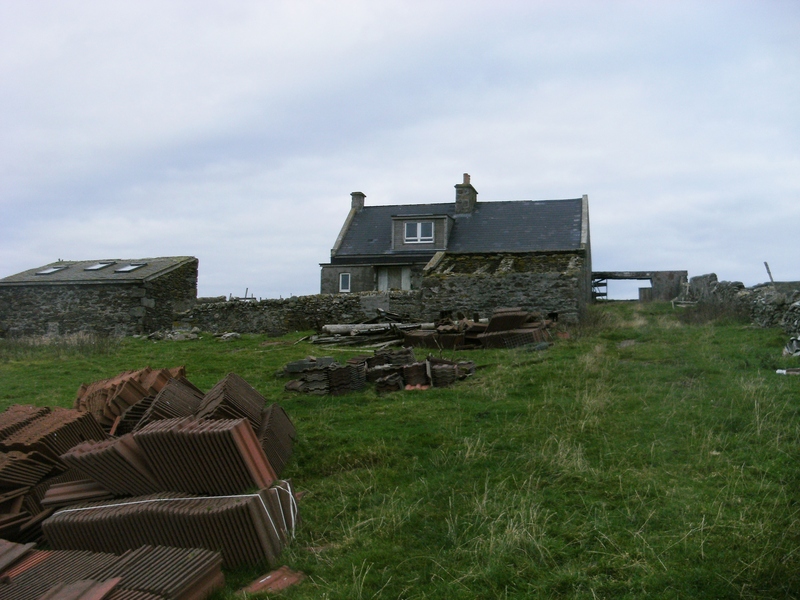 I would really like Unst folk to let us have photos and information of houses they know or have family links to. This would be a tremendous addition to the family history section of Unst Heritage Centre. We have a variety of maps and other documents at the Centre, as well as on line sites to check, so could help with the process. This could take some considerable time, but looks to be an interesting project! As I’ve written before (in Old Maps and Why is local knowledge important?) it is good to get to know the area where you are researching people. I like to look up the street names I come across on census returns that are outside Unst, partly to get a feel for where they are (since they are in areas I don’t know) and partly to double check the transcription. It varies on the Ancestry website whether they transcribe the street address for you or whether you have to work it out for yourself from the image. This afternoon I was scratching my head over one such example in the 1871 census for the Parish of Kirkdale in Liverpool, that I had to figure out myself. When the street name is indecipherable on one page my strategy is to page back through the other pages that cover that street to see if there is a better example of the same word. This time though, that didn’t work – all the example were are bad as each other – I couldn’t even guess at what it was, to even try to use a search engine to check my guess. So what to do then? Well, keep paging through the census return to find the neighbouring streets so that you can at least find the location of the street on the map, then maybe you can find it that way. Going earlier in census, the next street seemed to be called Pluto Street (obviously not named after the planet as it was only discovered in 1930); going later, the next street looked like Sterling Street. I started by searching for Pluto Street since it felt more unusual. I found Pluto Street, in Kirkdale, on a website showing an A-Z of Liverpool streets from 1901. In the same section of streets there is a Sterling Street and a Vesuvius Street. So that’s what it says! It’s obvious now that you see it! Ahem! Pluto Street no longer exists (and neither do some of the other streets near it), but Vesuvius Street does. Compare these two maps to see the area in 1901 versus how it looks today. 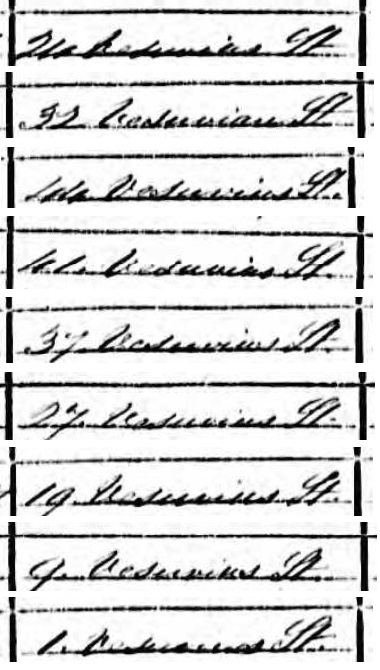 So when you find indecipherable writing in census returns (and there are plenty of examples of that!! ), don’t give up, you can look around the area, and home in on the street in question. Just remember that sometimes you have to look for older maps than those on Google Maps, since streets do change, and disapppear. As Cindy is, I am very lucky to be able to walk where my people walked. I don’t currently live in Unst, but I lived there for many years of my life and I visit my parents who still live there on regular (“Not regularly enough” – Mum) occasions. On one of my recent visits, my mum and I walked out to a pair of derelict croft houses at Clugan, where her great-grandmother lived as a little girl before the family were evicted to make space for larger sheep farms. It is a beautiful spot on a fine weather day with a sea view (well pretty much all of Shetland has a sea view – you can’t get more than three miles from the sea anywhere in Shetland) and the tiny island of Huney just across from the beach below the houses. I’m sure it is also a pretty wild place to be in bad weather, and as with many croft houses, fairly isolated. The above is a map surveyed in 1878, but the croft houses can also be seen on satellite images that make up the modern Google Maps. If any of my readers can also walk where their ancestors walked, I’m sure Cindy would love to hear about it on her blog too. Why is local knowledge important? When digging into your family history it is important to get to know the area where your family lived. The more you know about it the better off you will be at tracking down those elusive members that just don’t seem to show up for 20 years – they must be on a census somewhere. This is not just about knowing that the transcription of house name “Saft” is actually “Taft” or that there is more than one house on Unst called “Garden” so you can look for detail about which one it is. It is also going to help you spot the relatives you’re after when you’re looking further afield. Let me give an example. 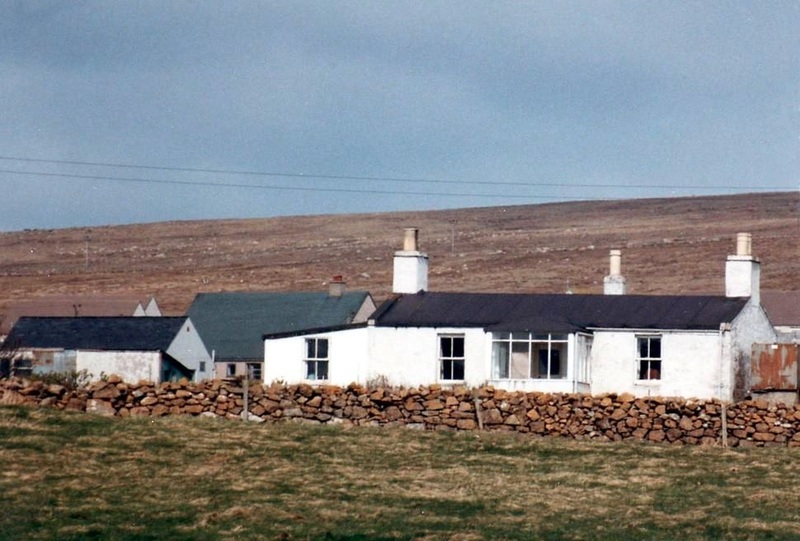 When you’re looking at people in a census return who were born where they live now, their birthplace will generally be recorded correctly, for example, “Unst, Shetland”, possibly in part, because the enumerator is also from the same place and therefore knows how to record that place. When they live further afield, the enumerator will not necessarily know the place they were born and so will have to record whatever they tell him. I’ve seen a number of examples of this during my research, here’s the most recent one which prompted me to write this post. In this example without the local knowledge of, in this case, Unst, you might not realise they were the same people. b. 28 May 1870 Parish School House, Unst, Shetland. Found in Unst census 1871 and 1881. Found in Lancashire census 1901 and 1911. With local knowledge I know that Baltasound is in Unst, and that this is therefore my missing James White. Without that knowledge I might have skipped over this record assuming it was somewhere that wasn’t Unst. So get some maps out and start familiarising yourself with the area. Perhaps even make a visit there to see the places for yourself. If you’re researching Scottish areas, you might find the Old Maps I blogged about before useful for this.